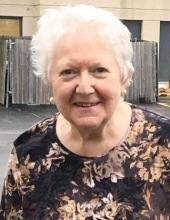 Joan A. Dame, nee Halloran, age 81 of Naperville, IL passed away peacefully, Saturday, February 2, 2019 at Silverado Memory Care of Naperville. She was born April 11, 1937 in Troy, NY to her loving late parents, Joseph and Elizabeth Halloran. Beloved wife of William R. Dame, wedded on May 10, 1958. Cherished mother of Kimberly (Donald) Gaither, Timothy (Dianne) Dame, and Gregory Dame. Loving grandmother of Andrea and Brent (Tiara) Gaither, Jaclynn, Jordyn, and Alec Dame, Danielle, Hannah and Thomas Dame. Fond sister of Robert (Joan) Halloran, Leo (Nancy) Halloran, and the late Rev. Joseph Halloran, Marie Jennings, Elizabeth Wall, and Richard “Dickie” Halloran. Joan was a long-time member of St. Raphael Church and resident of Naperville since 1977. She retired in 1998 from AT&T as an administrator after 25 years of service. Joan will forever be remembered as a loving wife, mom and grandma! Visitation: Monday, February 4th 5:00-7:00 PM at Friedrich-Jones Funeral & Cremation Services, 44 S. Mill St. Naperville, IL 60540. A future Celebration of Life service is being planned. Interment is private. To send flowers or a remembrance gift to the family of Joan A. Dame, please visit our Tribute Store. "Email Address" would like to share the life celebration of Joan A. Dame. Click on the "link" to go to share a favorite memory or leave a condolence message for the family.